A crumbling façade is about to be reborn. 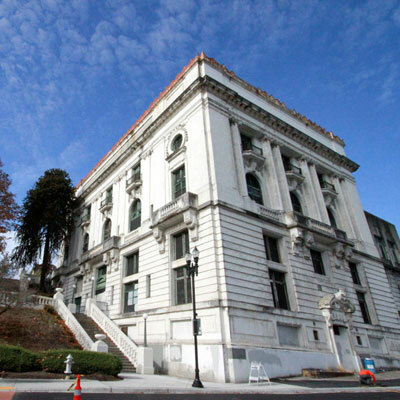 For decades, the prominent Tacoma Elks Lodge has perched vacant on the hill at 565 Broadway downtown, not unlike a large white albatross. The substantial stone structure commands attention. Its stature, intricacy and lore have long beckoned to natives and passersby. Soon, thanks to the cultural and rehabilitative wizardry of McMenamins, we’ll be able to go inside. McMenamins has an undeniable track record of crafting destinations that are inventive, engaging and charming. Using regional themes, local artists, carefully chosen materials and a keen understanding of Northwest history, they have breathed new life into dozens of historical properties. Designed by É. Frère Champney in the second Renaissance Revival style, the Elks Temple was built in 1915 and 1916, when popular fraternal organizations were making big impacts on communities. On the south side of the building, a sprawling stairway scales the hill. Modeled after the Scalinata di Spagna in Rome, the Tacoma staircase carries the same name, in English: the Spanish Steps. McMenamins Elks Lodge will include 44 guest rooms with private baths. The grand ballroom is being transformed into hotel rooms with terraced views of Tacoma’s waterfront. Inspired spaces will host live music, events, weddings and meetings. Three restaurants and a McMenamins brewery will be highlights of the entertainment. (There are also rumors of a “secret bar”—shhh!) Gardens on site will supply fresh, seasonal ingredients. Local artists are being commissioned to paint murals, and some large graffiti that accumulated during the building’s vacancy will be preserved. Stay tuned for the grand opening in early 2019. Take a staycation at other area McMenamins hotel and entertainment properties, the Anderson School in Bothell and the Olympic Club in Centralia. Dine and drink at McMenamins on Seattle’s Queen Anne or Capitol Hill, in Mill Creek, or at Olympia’s Spar Café.